Tyres From only £45.95 Fully Fitted. For a limited time only, an economy 205/55/16 Tyre will only cost £45.95 inc VAT. If your car could use a new set of tyres – or even just one or two, call us today on 01302 367 614 to see how much we could save you or click here to send us an enquiry immediately. Look up the correct tyre pressures for your car and check them at least every two weeks using a good-quality gauge. Check tyre tread and condition – look for cuts on sidewalls. If a tyre needs regular top-ups, it may have a slow puncture. Don’t forget to open the boot and check the spare! 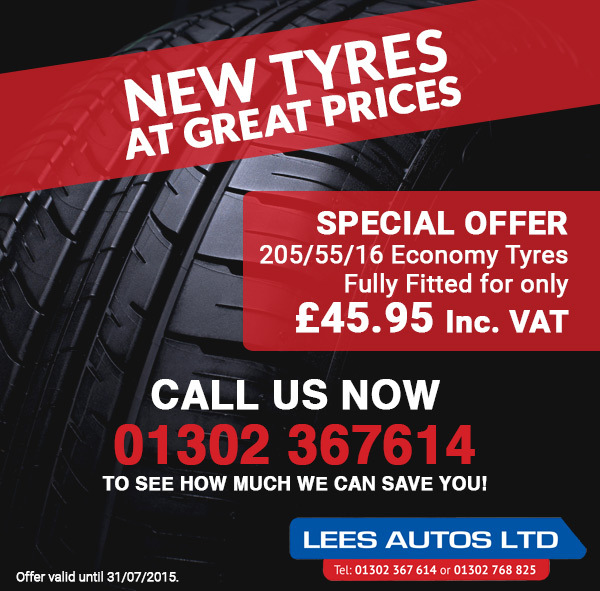 If your looking for Tyres, call us today on 01302 367 614 to see how much we could save you or click here to send us an enquiry immediately. ← Brake Pads now HALF PRICE… Extended until February!